For any organization to grow, it is imperative to hire the right candidate. Given the fact that misconduct and fraud are possible threats when it comes to hiring, companies have become extremely cautious. Thus employee screening plays a crucial role in verifying the background of the candidates and enable organizations take the correct decision. iCrederity takes care of physically verifying current/permanent addresses mentioned by candidates. We ensure a valid address proof is submitted by the candidate, in order to avoid any fraudulent activity. Our Employee Verification service eliminates the risk of wrong hiring, by thoroughly checking the status of the individual's certificate and standing with the issuing authority. All education certificates are verified for their authenticity and are cross checked with our comprehensive database of fake and unaccredited universities. Assure your business of nothing but the best resources and talents. At iCrederity we do an extensive employment history check for candidates, by verifying details like claimed employment period, position, reporting manager, compensation, and eligibility to rehire. iCrederity provides verification across Indian and global databases, so as to track down any fraudulent activity, performed anywhere across the world. We also run a scan across the world for any negative/unfavorable media coverage, ensuring nothing but the best to our clients. 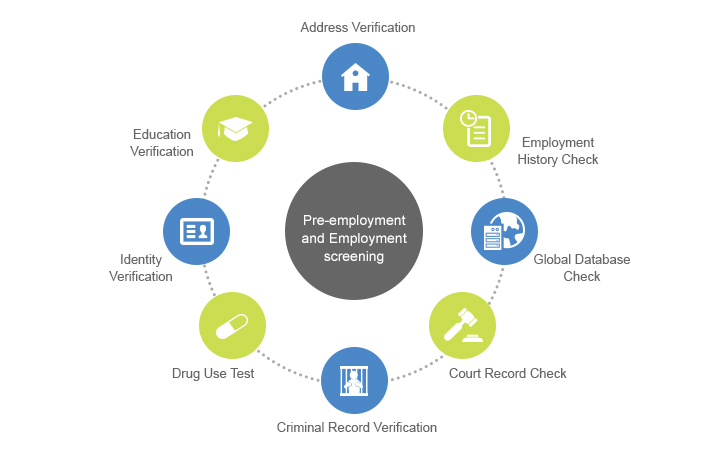 iCrederity’s Criminal Record Verification cross checks profiles of candidates with police records, to rule out any possible criminal records. This includes identifying the police station that has jurisdiction over present or permanent residential address of the candidate and confirming through the police records on the status. At iCrederity we run a comprehensive drug test for candidates, which are then reviewed by certified medical practitioners. Samples are collected and tested for possible drug use and the reports are delivered to the employers. All results are kept strictly confidential. iCrederity offers thorough verification of all identity proofs submitted by candidates, to eliminate the possibility of fake documents. Authenticity of Pan Card, Voter ID card, Passport and other documents are verified with issuing authorities. To rule out the possibility of hiring a candidate with a criminal background, iCrederity runs a check through all judgments and lawsuits in courts and tribunals across the country.